If you use air fresheners to keep your house smelling fresh, you will be happy to see this deal! 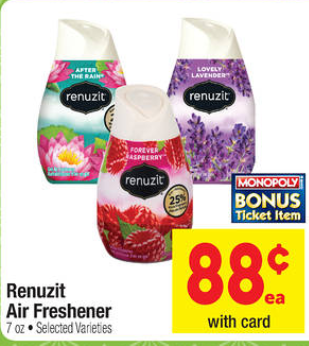 Renuzit Air Fresheners are only $.66 each with the weekly store sale and a coupon we have out! The apple cinnamon scent is my favorite! Plus these are **Monopoly Bonus Ticket Items** so you can get those extra tickets while spending less money! Final Price: $.66 each WYB 4! Previous article: Quilted Northern Bath Tissue As Low As $4.24 at Albertsons & Safeway + Monopoly Bonus Ticket Item!